(Photo Courtesy/Mike Beiermeister) Vicki Wright hangs a painting for the Besser Museum's upcoming exhibit. Alpena, Mich. — The Besser Museum for Northeast Michigan’s ‘Winter Blues Non-Juried Art Exhibit’ opens next week. It features over 60 pieces of artwork from artists all over Michigan. With so many different types and styles of art, one has to wonder how it all comes together into a nicely arranged gallery. Vicki Wright volunteers at the Besser Museum, helping design the art exhibits. Wright has been volunteering since she retired and moved to Presque Isle. She’s been designing different exhibits for 39 years as a director of collections and exhibits. Even with all of her experience, it can still be overwhelming when first walking into a blank canvas of walls. “There is always a little bit of panic because I think, “well, how am I going to get this many pieces in this small of a space, and this many pieces that are by this many different artists,” said Wright. The volunteer gallery designer helped arrange the layout for the ‘Winter Blue’s Exhibit’ at the museum. It’s a challenge, but pausing and observing each piece of art really helps her find a common flow. Wright got her start at a branch of the Phoenix Art Museum just outside of the city. She received a Masters of Art degree from Arizona State. Arizona is where her passion took off. 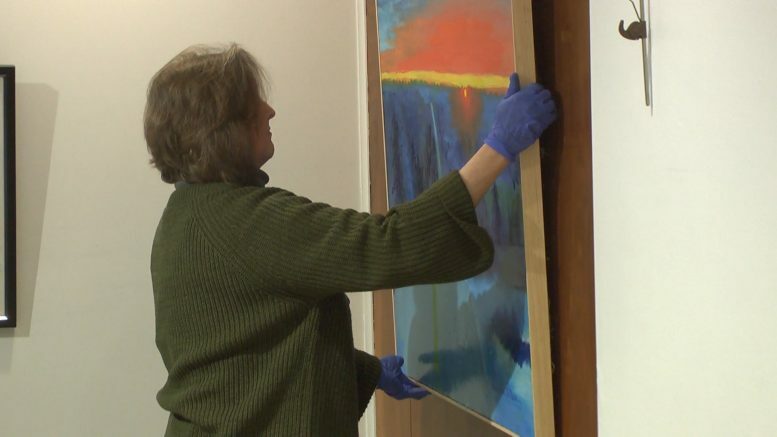 From there, she traveled to New Hampshire and then Kalamazoo, helping curate different exhibits. Wright retired a few years ago, but she still is finding time to volunteer her expertise.